The SNES Classic Mini is just days away, and we think it's pretty neat. It's as charming as one would expect, and does an impressive job of emulating its games - including some titles that were considered beyond the scope for the Wii, Wii U and New 3DS Virtual Console. An interesting quirk of the hardware, however, is that the board, processor etc are actually the same as the NES Classic Mini. This essentially means it's all about the operating system / software to distinguish the two systems; the following is from a Digital Foundry teardown. Confirming that the internal mainboard is the same, the corners - carved out to fit within the NES mini shell - remain the same on the SNES model, even though there is no real need for them to be touched at all. As a result, the new piece of hardware looks slightly less elegant internally. Hardware-wise, we're looking at the same off-the-shelf Allwinner R16 SoC (system on chip), featuring four ARM Cortex A7s paired with an ARM Mali 400 MP2 GPU. Hynix provides the single memory chip - a 256MB DDR3 module - and there's a generous 512MB of NAND storage. The magic comes from the bespoke Super NES emulation software layer, likely built from the ground up by Nintendo's Paris-based European Research and Development (NERD) team, running on open source OS, Linux. 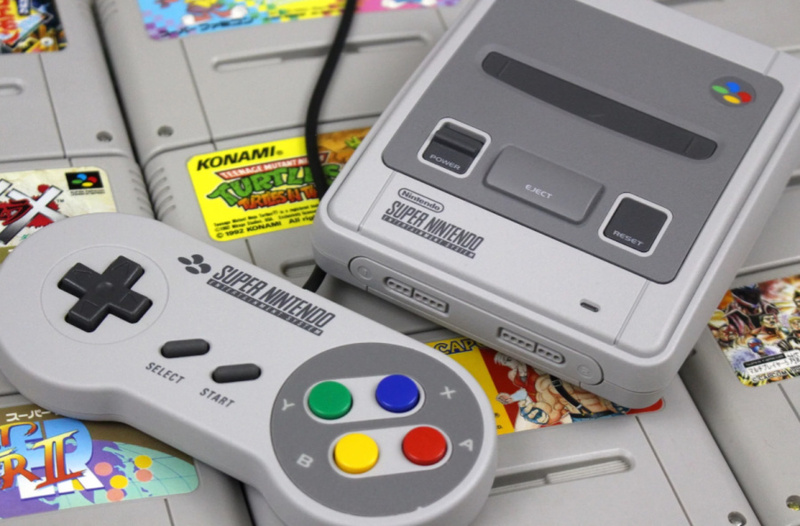 As Digital Foundry recently discussed, the software not only emulates the Super NES itself, but a range of add-on processors specific to select titles, including the Super FX and Super FX2 chips used for Star Fox, its sequel and Yoshi's Island, along with the SA1 CPU upgrade utilised by Super Mario RPG and Kirby Super Star. Even Super Mario Kart used additional hardware - NEC's DSP-1 was present in every cart, faithfully replicated for the mini consoles. While this may prompt some to complain, it's actually a smart approach from Nintendo. It was clear that the NES Mini didn't need all of these specs to run successfully, but all that excess resource has allowed Nintendo to use the same innards in the SNES. This adds context to the recent welcome news that there'll be increased SNES stock and a revival for the NES next year; Nintendo can churn out the hardware and simply alternate the shell and operating system when manufacturing. It certainly makes logistical sense. So, will you be grabbing a SNES Classic Mini this week? I prefer in all way my original one but its a good idea for the new generation of gamers. I will definitely be buying one I am going to get to my target early Friday morning and try to pick up one. So you're basically paying for the shell and games... Which actually isn't so bad I guess. Should have had 31 games imho. All the better as this means that NES Mini stock will be easier to get. Those looking to hack it will surely appreciate also. @Shiryu The NES classic could technically run some N64 and PS1 games on forked emulators, but not consistently well if I remember correctly. It is interesting that anyone who owns the NES mini already owns the same internals. But, this is about the whole package, the feel, the look, the cute, the presentation, and it always was. Looking forward to it. So there will be button input lag then? Got mine in the mail today Thanks Best Buy!! That said, I have access to both the original hardware on CRT and NES Classic on LCD calibrated to lowest possible latency and I never had any notable problems with button lag on the Classic. At least, I can replicate my high-score runs on a game like Zanac, so it serves the purpose well for me. Seems kind of odd they stopped making NES Minis if they knew they were just going to keep using the same hardware for the SNES Mini. Why not just keep the NES Mini in production until they were ready to release the SNES Mini? And even after that if they were planning on bringing it back? Oh yeah, supply shortages is their preferred marketing strategy, I keep forgetting. I can't wait for the modders to get a hold of this puppy!! The entire SNES library in one shot plus maybe more?? I'm in!! @ACK I played my NES Classic this week and was quickly reminded of the button input lag. Uuuuugh! Thank goodness I still have my original NES and SNES hooked up to the CRT TV I have in my bedroom! Thanks for the feedback. And yet charge more whilst also including less games. @Hughesy Games that were much higher budget, with much more play time value, and also including a second controller. I'm a long time Nintendo fan, collector, game, BUT, this is SHADY, really, really SHADY. I'm sorry, but re-shelling identical hardware and adding £20-30 more is scandalous. Besides, too many better alternatives exist for those who haven't a THING for the replica SNES casing. @rjejr Because they want to release the Super NES Classic Edition this year? @rjejr might have something to do with licensing on the third-party games..
@Pazuzu666 Where can I buy an SNES, 21 SNES games, and two SNES controllers for $79.99? @joey302 unfortunately the entire SNES library is many GB in size. You won't fit it all on the SNES mini. @bolt05 I'm sure they can fit them all. Some of the top SNES games are only 70-80 MB. @Kalmaro Yeah, we're paying obviously for parts and the shell, plus the fact the OS and software for the emulation obviously had to be developed and mastered. Though, to be fair, these let you play your older games so that's cool. Got 2 on pre order. Might attempt to hack one. Keeping the other pristine. I would like to confirm my 8bitdo retro classic adapter works as I was playing with my switch pro controller... however the buttons were paired for the nes classic with x and y being turbo. My nes30 controller has an x y (not turbo config) so hopefully that will work But it is charging at the moment and I don’t wanna short charge it. I am just happy the receiver works although I figured it would. Translation? I was going to say something but better not. Whatever I say will be attacked anyway. @Kalmaro A two-in-one console doesn't make sense. What would be the design? What would you call it? The NES and Super NES Classic Edition? Controllers are different. Would you include both NES and Super NES controllers? Also, the price will be significantly increased. As for putting it on the Switch, you completely miss the point of this product. @NinNin I pointed out that they let you play your older games. Beyond they, you're just paying for the shell. If none of that appeals to someone then I don't see what point is. I've been saying it before this was even announced on a few game forums and here too many months ago. The hardware was grossly overpowered and Nintendo is very well known for being cheap, re-using tech to death to save money, and beating things into the ground until there's no room left. This fit the bill the moment I saw someone not only get N64 games up on the NES CE but optimizing them (like Mario Kart 64) to run at a locked solid 60fps.) Since then I swore there would be at least a SNES if not also a N64 and if it went portable GB+GBC and a GBA player on the go. The hardware is nuts for what it can handle given they tossed an old NES at it. They found the cheapest solution with the most power under the hood. @Kalmaro Isn't it obvious that people who buy a Super NES Classic Edition want to play the included SNES games. Also, if you buy a PS4 or an Xbox One or a Switch, you're paying for the shell as well. I don't see your point. It's like you're saying that if you don't want to play Switch games, you don't see the point of buying a Switch. While that's true, it's pointless to say an obvious thing like that. Obviously, people don't buy a Switch to play PS4 or Xbox One games. My hope remains, that these are just cash grab expirments in order to develop the best quality emulators for the Nintendo Switch. I desperately want the Nintendo Switch Virtual console to support up to GameCube and GBA titles. @NinNin My issue is that there is no difference between the NES and SNES classic, apparently. Just the shall and controllers. Unless I'm misunderstanding the article. @Shiryu It's hardware is more powerful than the original Wii, which has N64 VC games, so most likely yes, you are also looking at the internals of the N64 Mini. Hardware emulation removes lag. I.E. the AVS or Analogue NT Mini via fpga boards. There's also lag free scaling of original hardware with the OSSC. I've beaten Punchout on on my AVS on modern TVs whereas I can't can't come close on the NES mini. That game is essentially broken on the mini. That said, the SNES mini doesn't have any games that truly require a high reaction time so it should be good for the games it has. Super Mario Kart doesn't feel right with VC type lag to me but it seems most don't notice it and I can still beat it. NERD team is the best! As for using Linux, it's a wise choice, they can't use Windows, since that's Microsoft, either that or Mac OS, iOS or Android. NERD actually writes good emulators, unlike the one on the Wii U Snes VC. NES mini had more filler games. Of all the SNES games I've seen, I've never seen one larger than one megabyte! "I'm sure they can fit them all. Some of the top SNES games are only 70-80 MB." best name ever for an r&d team. Snes games range from 4 megabits (512 KB) all the way up to 48 megabits (6 MB), but only two games ever got that big. Not sure where he got those weird sizes from. @ACK What about Punch Out, can you beat Mr. Dream without any problems? I've never played against Mr. Dream/Tyson on original hardware, and noticed that when trying to play the game as an adult I never really go far into it. (Also consider that as a kid I would continue playing until I beat it, as an adult there's less motivation.) Then I learned about the concept of input lag and I wondered if that's the reason why. I saw a video about this guy who beats Mike Tyson's Punch Out once a year, as part of a personal ritual that he has, but he couldn't beat him on the NES Mini. That will be me hacking mine then. @mikegamer Quality over quantity? No. Adding DKC2 wouldn't mess it up, nor would chrono trigger or bombeman or any other 9 games. Don't be an apologist trying to justify it. I have the same question as @Shiryu, is the hardware up to doing an N64 Mini Classic. I really hope so, and not just because I want to raid the recreated controllers for fresh analogue sticks! @NinNin you can't. This isn't SNES hardware and 21 individual SNES cartridges you understand? This is a VERY cheap board using software/emulation. You can purchase a Pi 3 and 2 iBuffalo SNES pads for (roughly) the same price and score every SNES game release plus many, many more - should you be inclined. @aaronsullivan "about numbers of available parts"
But aren't all of these parts basically off the shelf stuff available probably in the billions? I know billion sounds like a lot but if Apple can do it w/ iPhones Ntineod should be able to do it w/ what amounts to little more than a Raspberry Pi. And they didn't need anywhere close to a billion anyway, they needed 10 million instead of 2 million the actual NES Mini number. 10m is far from 1b. 2m was just stupid. Why even bother stupid. No, I'm blaming it on their stock shortage way of thinking, the only parts problem they had was the number of shells and controllers they built b/c in their head - though they never told anyone - this was what it was - a stop-gap Christmas item until they had the Switch ready in early March. I'm a man who doens't believe in coincides, and them running out of stock of NES Mini just when the Switch released, well, that's not a coincidence, that's a plan. The real problem was they planned to sell 2 million when they probably could have sold 10 million. Had they taken 8 seconds to do a twitter poll they probably could have figured that out, but all those guys at Nitnedo HQ are so full of themselves they think they know everything and just makes decisions w/o doing any actual research. If they did actual research StarfFox Zero, AC:aF and MP:FF would have been much different, or at least named and presented differently. Of course they seem to have done a pretty good job w/ Switch, but even a broken clock is right twice a day, the other time they were right was cutting the price of 3DS from $249 to $169. I know no company wants to make more than they can sell, too have too much stock sitting on warehouse shelves, but I really believe Ntinedo takes it way too far to the other extreme, like they figure out what they think will sell, then rather have a 20% cushion to allow for theft and damaged merchandise, they go 20% below that number, figuring it's better to run out of stock than make the few extra $ selling that extra 20%. They really really don't like extra stock. So when they miscalculate NES Mini by 5x b/c they don't bother doing any research by having preorders, well that's a disaster. Well they were already paying for the games, and they'll be paying for them again next year, why not just pay some more up front? Who signs a contract for exactly 2.3m units - the number for NES Mini sold - w/o putting in a clause for more if the item is a success? It's a good thought, but I can't see it being a factor. Not that I know anything for sure of course. Besides, Reggie has already said on numerous occasions they predicted demand based on sales of Sega clone systems, he's never once mentioned licensing. So, less about licensing, more about Ntinedo royally screwing up. @NinNin "Because they want to release the Super NES Classic Edition this year?" Well they are doing that, but they are also bring back the NES Mini anyway, so what was the point of stopping production, besides giving everyone an ulcer over the holidays? @rjejr You answer your own question within the question. The reason they couldn't keep producing NES Classic consoles was because they were literally using production capacity to create SNES Classic boards instead. @rjejr I don’t think the different reasons we are talking about for pulling NES mini are mutually exclusive. No reason it can’t be both. As for parts, the board inside these isn’t full of rare stuff, as far as I know, but I think people underestimate how long it takes to create millions of devices of any kind. If you get the message that you way- underproduced on one product and a similar product is coming next year, deciding to make 5x as many means you have to start right at the moment you find out. At that time, every NES mini you make is one less SNES classic for launch. So, yeah, they pushed out some more and then, I’m guessing, cut it off and made a new deal to start cranking out SNES classics for the remainder of the year. None of this means you aren’t right about them poorly estimating the demand (though, that was a hard estimate and going with how other comparable products sold was problematic but understandable. I mean, look at the kickback on every article: you don’t need this, get a Raspberry Pi, emulators do this already and they’re “free”, etc. That’s from the dedicated gamer crowd — the crowd they underestimated. I really don’t think a twitter poll would have changed much of anything.). And yes, the Switch launch was probably a strong consideration as well. Nothing should have been allowed to distract from that and the success so far makes it hard to argue that they should have. Artificial scarcity? I think Nintendo likes to play with the line there, being right under the demand level creates some hype (and keeps units out of the warehouse), but being off by this much? I don’t think anyone at Nintendo would consider that any kind of success. But on your side, I think these mini classic devices are framed as partially collectibles, like the similarly problematic amiibo. So, they might make decisions that trade some customer frustration for making them into prize possessions. Anyway, Star Fox Zero and those other games, I don’t see it as a research problem... they were just unfotunate casualties of the need to stopgap when the decision was made to drop-kick the Wii U into deep space (where only My Nintendo Rewards can find it). @Heavyarms55 I hope that do that with the Switch, as well... but you know what? I do want a pile of plug-n-play collectibles, and then I’ll ditch my barely working originals that take up too much space, and aren’t worth the effort to get running right... not when there is a nice replica with brand new controllers that is cute and works with modern displays. It’s best of both worlds for me. Though, I understand why it’s not for everyone. @Mechageo "because they were literally using production capacity to create SNES Classic boards instead"
So your telling me since NES Mini production stopped 7 long months ago they've been making SNES Mini? So they'll have 70 million SNES Mini ready at launch? I doubt they've been manufacturing SNES Mini for the past 7 months, if they were they could have started putting them on sale 3 or 4 months ago. Or, make half the amount of each system. But 7 months with neither on the shelves, that's very hard for me to believe they've been making SNES Mini all this time so they had to stop making NES Mini. And the board is the easy part, they could probably literally get as many of those as they wanted, it's the controllers and the shells they would need to make more of. But the 7 months between each system being on sale is too long of a gap just to change over from one to the other. @aaronsullivan I'm pretty sure the "get a Raspberry Pi instead" stuff was mostly either sour grapes from people who couldn't find one or Xbox/PS4 fans just dumping on it. A raspberry pi kit on Amazon is about the same price as the SNES Mini so it's not like Ntineod was selling these for $199 or something where it was a big rip-off. I feel like they planned them like it was that price though. I still think this could have been one of THE items this holiday, stacked up at the front of every store BF morning on sale for $50 for 1 hour only, 4AM-5AM. The only reason it didn't happen is b/c Nitnedo didn't make enough. 30 classic games for $60, that is basically a stocking stuffer when Zelda BotW amiibo are going for $20 and $16. And if they made too many for the holidays, well just keep selling them for years. As I just explained to the other guy I think 7 months is too long of a gap between systems for that to be an actual reason why they had to stop NES Mini production. 3 or 4 months maybe, but not 7. I seriously doubt they've been making SNES Mini for the past 7 months. I could be wrong about that, PS3 was delayed a year b/c of blu-ray drive issues, but the NES innards seems really easy to cobble together. Not selling NES Mini while they were launching Switch seems more logical. And as much grief as I give Nintendo HQ, well sometimes it's an easy call. NES Mini was a holiday gift, the end. The end of sales, marketing, and production. If Nintnedo wants to give away the few remaining Wii U for 10,000 Platinum points on My Nitnedo I'd play a lot more SMR though. Well maybe not too much, I'm still annoyed at that buy-on-every-system DLC model. $10 was bad enough, but I have both an Android phone and tablet that I use about equally, I'm not buying it twice. Defeats the whole ecosystem. Well see how things go w/ the $5 sale. @rjejr "So your telling me since NES Mini production stopped 7 long months ago they've been making SNES Mini? So they'll have 70 million SNES Mini ready at launch? I doubt they've been manufacturing SNES Mini for the past 7 months, if they were they could have started putting them on sale 3 or 4 months ago." That's exactly what I'm saying. Most reports show that there will be more SNES Mini consoles at launch than were created during the entire production run for the NES Mini. @rjejr "Well they are doing that, but they are also bring back the NES Mini anyway, so what was the point of stopping production, besides giving everyone an ulcer over the holidays?" I guess it's because they figured that they wouldn't be able to satisfy the demands for both products at the same time. @Kalmaro Okay. I understand that. Higher specs would be a waste, though, if they aren't required. @Pazuzu666 Pirating isn't a better alternative for many people. As far as I know, this is the best deal if you don't want to pirate games. @NinNin @Mechageo OK, well if that's what you guys think it shouldn't be any problem picking one up then. We'll see how the stock is tomorrow. Does anybody know if Ntinedo has ever given a number for SNES Mini stock? We know NES Mini sold 2.3m, we know Switch has sold 4.7m, we know Switch is supposed to sell 10m this year - or it's first fiscal year - 3DS has sold about 65m. Has Nintnedo ever given an actual number of how many will be available starting tomorrow and throughout the SNES Mini sales period? Surely they must KNOW the number, they paid somebody to make them. Whatever. It'll be hacked in no time anyway. @joey302 I wasn't guessing. I have every SNES game on an SD card. You need more than 512mb. @joey302 depends if they can get the emulator on the mini to run zipped roms. Maybe. @bolt05 here's hoping! I'm picking it up tomorrow night just to have the regular version! 21 games is a bit skimpy (thought the nes mini was skimpy too at 30) but the game selections were good but wow there's so many others I can think of! Oh well. @joey302 agreed mate. I get mine on Saturday 😀. @bolt05 enjoy! As a side note I also have my radar out for the Atari Flashback Gold Activision edition!!! They finally added the classic Activision 2600 games to the collection so I'll have to nab that too (I'm such a retro junkie!) cheers! USA - 788 total, about 690 MB; * Europe - 610 total, about 560 MB; * Japan - 1551 total - about 1.5 GB; * for Korea, there are 2 games; * Hongkong has 1 game; * there are some betas, bad dumps, some unlicensed etc.